The Islands of the Blessed by Nancy Farmer book III. "It's a wondrous tale of hobgoblins, mermaids and sea hags, Saxons and Northmen, old gods and young bards, thoroughly steeping readers in Norse mythology. It's also a long, beautifully written tale, expertly weaving together several story lines and informing readers new to the series of crucial plot points from the previous volumes." Review by Sarah A Wood.. 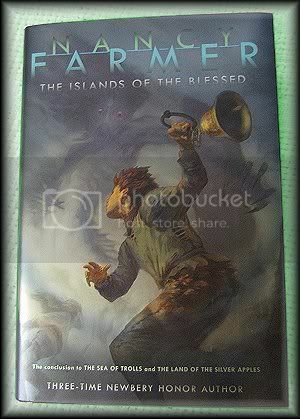 THE ISLANDS OF THE BLESSED is the third installment in Nancy Farmer's The Sea of Trolls trilogy. Set after the Viking raid of the island monastery of Lindisfarne in 793, her series explores the collision of Christian, Pagan and Norse cosmologies against a background of magic and mythological creatures. 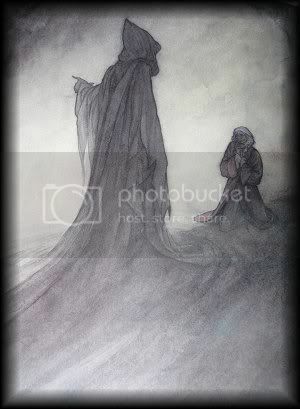 The final book also confronts some of the uglier aspects of these belief systems, whether it is the severe penitence Father Severus demands of his fellow Christians or the ceaseless battle that is part of Valhalla, the Northman paradise. As servants of the life force, Jack and Thorgil must put aside their pasts and prejudices to heal the wounds that have been committed in the names of various different deities. Book 3 gives us yet another adventure for Jack and Thorgil. Jack has aged a few years since book one and as apprentice to the Bard continues to gain in his powers. Thorgil probably does her most changing in this book and when the book ends at least we know basically what happens to them both. I don't know if Ms Farmer intends to continue this series or not.. basically it did wrap up most things but having read fantasy for many years.. the door is always open, even if she decided to pick up years later when they are older. I did enjoy all 3 books but I would lie if I didn't say that there were other characters that I would have liked knowing more about. They were there and given just enough to get you interested in them but then fade away leaving just the main protagonists. On that note I will say that I enjoyed these books. The chapters are short, which makes me read more each sitting. I would read more of her books if she should decided to continue them, and I will pass these books on to my 13 yr old grandson who I know will enjoy them as much as I did. *Starred Review* Safely returned from his perilous stint among Northmen, 12-year-old Jack reflects, "That's the nature of adventures. . . . They're nasty while they're happening and only fun later." For readers, though, there's satisfaction in both the nasty and the fun, and this sequel to The Sea of Trolls (2004) offers full measures of both. After Jack learns that his often-bratty little sis is a changeling (and that his real sister likely dwells with hobgoblins), a misguided exorcism results in Lucy's disappearance. Then the young bard must descend into the out-of-time Land of the Silver Apples to retrieve both of his lost siblings. In that richly imagined realm, surprises include a reunion with shield-maiden Thorgil as well as creatures whose appearances deceive—shape-shifting knuckers; hideous yet likable hobgoblins; and lovely, soulless elves, whose inability to grow or age tinges their existence with tragedy. I have to admit that the review from Booklist says it all without spoiling too much of the book. Nancy Farmer has certainly done a lot of homework before writing these book! Not only about Vikings but about Pictish Symbols, Din Guardi (now called Bamburgh Castle) and about old and new religions. With all this information at hand she has written a well rounded adventure with some very likeable and some not so likeable characters. I've now enjoyed two of the three books and totally expect to enjoy the last one, which I will begin reading today. There are lessons to be learned in this YA adventure also. One that stood out to me was the old saying, you can't judge a book by it's cover (sometimes true enough..but other times...) or what you see is not necessarily what you get or even don't be too fast to judge a person on their looks. There are some old and some new characters in this book. I liked seeing Thorgil again and hearing Olaf mentioned, but I did enjoy the new characters also, and I was happy to even "enjoy" the Hobgoblins! I already know I will pass this series of books along to my 13 yr old grandson! I guess that means I'm enjoying them! 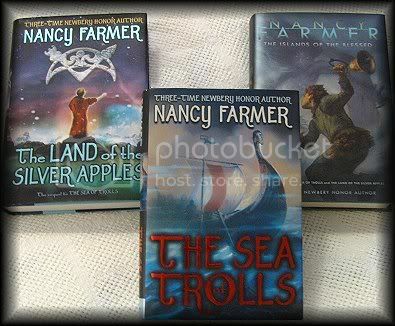 The Sea of Trolls by Nancy Farmer is book one of her Trilogy. 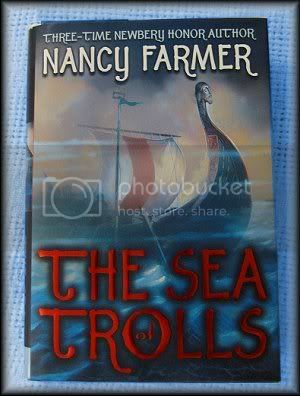 Three time Newbery honor author Nancy Farmer's epic fantasy, The Sea of Trolls, is gigantic in every way. There are big Vikings and bigger trolls. There are big themes--hope, despair, life and death. At a substantial 450+ pages, the sheer size of this hefty tome is impressive. But, like all of Farmer's fine work, the large scale has room for enormous quantities of heart and humor. At the center of this massive adventure is a small Saxon boy named Jack, who's never been much good at anything until the Bard of his medieval village makes him an apprentice. Then, just as Jack is learning to tap into and control his power, he is kidnapped (along with his little sister, Lucy) and taken to the court of King Ivar the Boneless and his half troll queen Frith. When one of Jack's amateur spells causes the evil queen's beautiful hair to fall out, he is forced to undertake a dangerous quest across the Sea of Trolls to make things right, or suffer the consequences--the sacrifice of his beloved sister to Frith's patron goddess, Freya. Along the way Jack faces everything from giant golden troll-bears to man-eating spiders, yet each frightening encounter brings wisdom and understanding to the budding young Bard. No quester who enters these pages with Jack will go away unsatisfied. After hearing Cath say how she enjoyed this book I decided to get to it myself since I have the entire trilogy sitting in my tbr pile! So.. I read book one and did enjoy it very much! It did seem a touch out of the range of a 12 yr old now and then but still I did enjoy reading it. There were many great evil characters like trolls (duh) and dragons and even Olaf, the head Viking that steals Jack and his sister to sell as slaves is evil ... and yet.. we find there is also something about him to make you "sorta" like him. There's a part in the book where a giant spider has unknowingly taken Jack and I had a little feeling of the Hobbit and LOTR lol.. but probably only because it was a giant spider. The story itself is a little different from most YA books I have read and I'm always glad when someone comes up with something really new to me. The adventure was a good one and moved along at a good pace. I am glad I have the other books to continue the story! 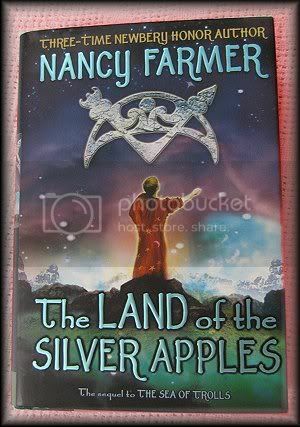 I don't know if I will finish book II, The Land of Silver Apples before the new year, but I will give it a try! As I always do when I begin a book I take off the paper cover to preserve the artwork. This particular book is illustrated by P.J. Lynch, who did a really beautiful job! Under that beautiful cover I found this on the hard cover..
Old Marley looking up at me! 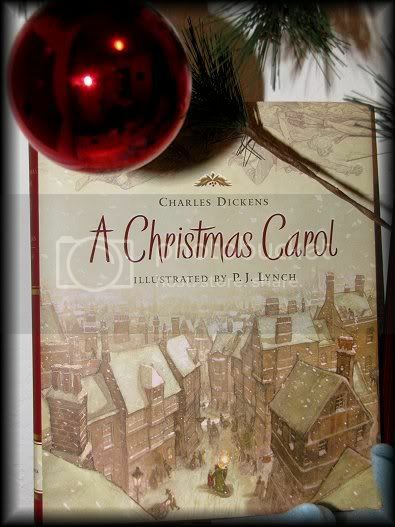 Inside, along with Dickens Christmas Carol are wonderful illustrations by P.J. Lynch. This book is so filled with drawings that you feel as if you are watching the movie and reading the book at the same time! Even knowing the story (and the ending) .. this was still great to read instead of just seeing the movie. But before the Holidays are over I do hope to see at least one of the movie! 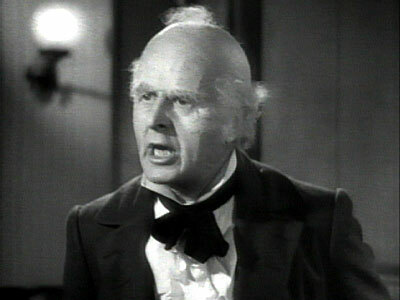 Or: another I remember a lot was one put out in 1951 where Alastair Sim played Scrooge. 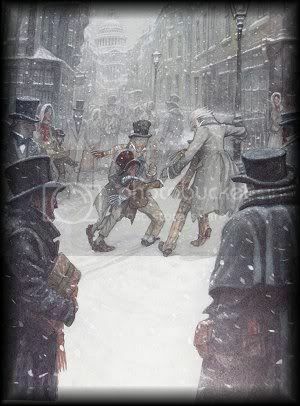 and of course... Patrick Stewart as Scrooge..
How many times can one read the book or see the movie? Every year that you celebrate the holiday! This copy of A Christmas Carol is superb! A keeper that I hope to open over and over again... and so should you! In this fifth book in the Magykal series, Septimus ends up on a captivatingly beautiful island, one of seven set in a sparkling sea. He's stranded there with his badly injured dragon, Spit Fyre, along with Jenna and Beetle. There are some strange things about the island, including a Magykal girl named Syrah, a cat-shaped lighthouse that has lost its Light, and an eerie presence that sings to Septimus—can he escape the persistent call? Angie Sage has done it again with another (continuing) adventure for Septimus and his friends! 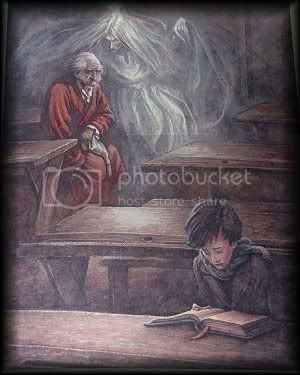 This is the 5th book about the young Septimus (Apprentice Wizard) and his family and friends. By now they seem like old friends and although they always seem to get out of any trouble they find it's always a fun read and always enjoyable to have old friends around once again. I've enjoyed this group of books so much that I have kept them all for myself. Yes, they are YA books but then there have been a number of YA books that I've decided to keep and the Septimus Heap books are among my honored possessions. As in all series it really has to begin at the beginning, to meet and learn about the characters. Once they have captured your heart you have no trouble reading on and on. Angie Sage has done a great job writing this series and making some memorable characters. 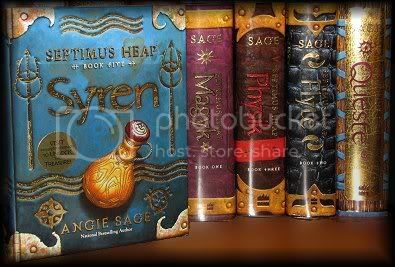 I don't know if there will be more Septimus Heap books but the door is wide open to continue them for some time to come... and I hope this isn't the end and that we see more of Septimus in the future. I find the Library Journal review a spot on telling of the book. Cashore writes of very strong women but she does give credits to those who help teach her what she needs to know. Then of course there is always "life's lessons" along the way. It was very interesting to read her mental struggles as she determines when and where and how she uses her powers. 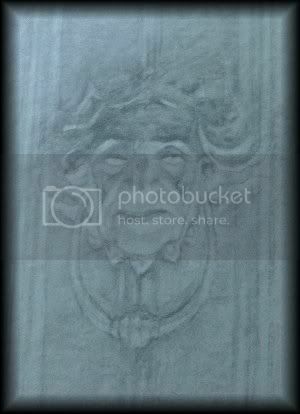 As a "monster", one of Fire's hardships is the fact that any human man that looks at her falls in love with her. Even as a young person, I , personally, never had such a problem, but ... there are always "beautiful" people that you know or see and wonder what it would be like to be so beautiful. In this book you find it's quite a problem! Humans can learn to block their minds to the human monsters with this power and so it is with Brigan, a man sent with a partial army to bring Fire to a castle to help interrogate prisoners. Brigan would become her love interest but she fights the feelings because she is a monster. Fire's hair and monster animals are all brightly colored in this world Cashore has given us. They all sound "beautiful" and it's their beauty that makes their prey stand still and stare until they are captured . Are you finding any of this interesting? Well, I did. And although it took me much longer than usual to read I never once thought to set it aside. 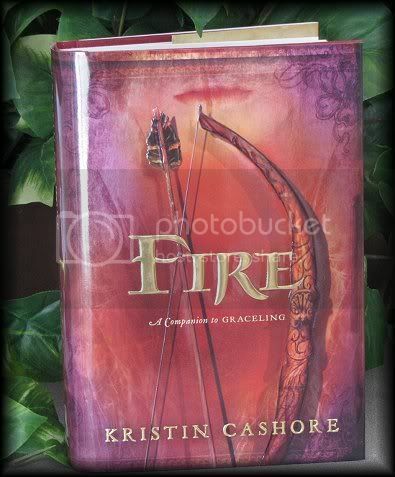 This was a very good book that not only has a good story to tell, but sets of the lands in which Cashore's stories are told. Although I don't know her intentions, if she will return to the Graceling or not, what she has done is to set up a world where, if she chose to, she could have many individual (stand alone) stories of different characters ..or.. have more about the characters she has already introduced us to. All in all I enjoyed this book quite a bit. And I do think that if you liked Graceling you will enjoy this story too.. though the story is quite different, it does embrace problems, and adventure, a strong woman, and romance... it seems to be a very good combination!